Received June 2, 2018; Revised July 30, 2018; Accepted July 31, 2018. Fractures at the thoracolumbar region are commonly followed after major traumatic injuries, and up to 20% of these fractures are known to be burst fractures. Making surgical decisions for these patients are of great interest however there is no golden standard so far. Since the introduction of Thoracolumbar Injury Classification and Severity (TLICS) score in 2007, it has been widely used as a referential guideline for making surgical decisions in thoracolumbar fractures. However, there is still limitations in this system. In this clinical case report, we introduce a L1 burst fracture after motor vehicle injury, who was successfully treated conservatively even while she was graded as a TLICS 5 injury. A case report is presented as well as discussion on the limitations of this grading system. Fractures at the thoracolumbar region are frequently followed after major traumatic injuries, and up to 20% of these fractures are known to be burst fractures , which are accompanied with instabilities with or without neurologic symptoms. Various different recommendations for treatment have been introduced previously, however it is still under debate. To guide surgeons making their treatment plans, the Spine Trauma Study Group proposed a system which shows an algorithm making decisions between surgical management and conservative care [2,3]. This system is sum of numerical scorings based on three different categories. 1) The radiologic injury morphology, 2) neurologic status, and 3) integrity of the posterior ligamentous complex (PLC) (Table 1). This scoring system; Thoracolumbar Injury Classification and Severity (TLICS) score is the first one to make quantitative scores and to be used as a guide to make clinical decisions among surgery and conservative care. Although several studies have reported its validity and reproducibility [4,5], there are still some questions regarding the use of TLICS system. Sometimes patients with low TLICS scores fail to heal by conservative treatment, and sometimes those with high TLICS scores heal successfully without any surgical interventions. Here we present a patient with unstable thoracolumbar fracture after major trauma, whom was treated without any surgical interventions but healed successfully, and discuss on the limitations of TLICS system. A 60-year-old female visited our center due to multiple trauma by a motor vehicle accident. The patient presented hemodynamic instability with increased heart rate (HR) and low blood pressure (BP). The HR was 136 and systolic BP was 80 while diastolic BP was 50 on admission, indicating hemodynamic instability. Central venous access was achieved promptly, and fluid resuscitation was done and her vital signs got stable within the first hour after admission. 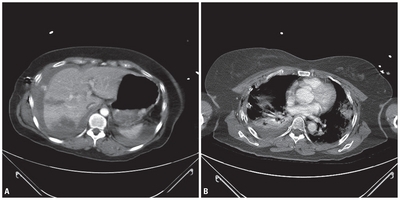 As the patient showed clinical evidence of paradoxical chest expansion and chest radiograph revealed bilateral pneumothorax, bilateral closed thoracostomy was done for immediate chest tube insertion. Thorough evaluation was done for traumatic injury workup, and multifocal laceration at the right liver with active bleeding at S6 and 8 was noted with a small amount of hemoperitoneum. Bilateral hemopneumothorax was found with multiple rib fractures, extending from bilateral 1st to 8th ribs. Her brain computed tomography (CT) did not show any significant radiologic evidence of traumatic brain injuries, however multiple transverse process fractures and lumbar vertebral fracture was suspected on abdominal & pelvis CT scan. So further evaluation for thoracolumbar injury was done. The abdominal and thoracic CT scans of the patient are presented on Fig. 1. On neurologic examination at admission, her neurologic status was uncheckable due to confused mentality and irritability. However, her both lower limbs showed symmetric motions with grossly better motor than grade 4. The rectal tone was intact, and voiding function was uncheckable as the urinary foley catheter was inserted on admission. The spine CT scan revealed acute burst fracture at the L1 body with some anterior subluxation between T12 and L1, indicating possibility of a highly unstable injury at this segment (Fig. 2). Further magnetic resonance imaging (MRI) scans were needed for further evaluation of the PLC. However, as the patient was hemodynamically unstable and was intubated, was under mechanical ventilation support, further MRI studies were delayed. Two weeks after the primary injury, her vital signs were stable and a MRI scan including fat suppression images were taken for further evaluation, and it showed unstable bursted fracture at the L1 level with prominent retropulsion of the fragment. Multilevel interspinous ligament partial injury with adjacent deep muscle strain was also seen throughout the entire T-L spine junctions, suggesting significant PLC injury at the fractured index segment (Fig. 3). According to the TLICS system, the patient had a burst fracture with significant PLC injury which indicates five points, and this is usually considered as an indication for surgical decompression and stabilization. However, due to high risk of general anesthesia related with the major injuries at the lung, chest wall and liver, the surgery was delayed. On the follow up CT scan 2 months after trauma, the patient revealed no further progression of segmental kyphosis, a slight progression of vertebral height compression but no deterioration of neurologic exam (Fig. 4). On flexion/extension dynamic radiograph images, no segmental motion was seen, suggesting no evidence of instability at the fractured level (Fig. 4). And most importantly she did not complain of any neurological deteriorations. We decided not to operate the patient, but to follow her up with close observation and serial plain radiograph images. Up to 6 months of post traumatic follow up, she is stable without any neurological changes or radiographic changes on her last visit. Thoracolumbar spine fractures following major trauma are common features faced by trauma surgeons. Among these injuries, unstable fractures carry a high risk of morbidity and mortality, as well as neurologic complications, and therefore it is important for spinal surgeons to make adequate decisions whether to operate the patient or not. Given this substantial clinical importance, many efforts have been made to establish an agreed indication for surgical treatments. However, the issue is still under debate, and many surgeons still tend to follow their own preferences based on their experience [3,6]. The TLICS system has been introduced by Vaccaro et al. in 2005, and it is a system giving emphasis on the injury morphology, PLC integrity and neurological status (Table 1). Since its introduction, it has been widely used, but recently some criticisms on this system have become an issue. Some studies have reported clinical cases of burst fractures of TLICS score 4 or less with resultant failure of non-surgical treatment and presented some limitations of this system [7,8]. However, to our knowledge, there has been little that showed successful treatment of TLICS 5 or higher thoracolumbar fractures by non-surgical management. In this case report, we presented a case of non-surgically treated TLICS 5 lumbar burst fracture at the L1 level. Although some progression of height loss at the index segment was noted during follow up, the clinical significance of this radiologic change was limited and the patient did not show any significant instabilities even after 6 months of follow up. This result suggests that TLICS system itself is not a perfect system. It is not this case report alone that supports the limitation of TLICS system. There are already previous reports showing certain regional variations when making decisions for surgery in thoracolumbar burst fractures [9,10], and these results do not support the use of TLICS system in their clinical practice. While our case presents a case suggesting that even high TLICS score fractures can be treated successfully without any surgery, Shen et al. reported that there are certain risk factors for the failure of thoracolumbar burst fractures treated non-surgically according to this system. As mentioned in the introduction, the TLICS system introduced by Vaccaro et al. has been known as a simple but reproducible and validated severity scoring scale. Those studies supporting the clinical reliability of TLICS system are numerous, but little has strong scientific evidence, mostly limited to small case series or reported by the inventors of this system themselves [4,11]. In our case, if the patient was not at high risk or general anesthesia, we would have performed surgical stabilization for this patient according to the TLICS system. But in certain patients, especially in those like this patient whom have major traumatic insults, surgical intervention itself could be a worsening factor, so sincere case by case approach is needed. As we delayed the surgery, the patient could have a chance to heal without surgery. If she did not, the surgery could have been done after she was stabilized from the initial multiple injuries. Although we cannot scientifically approach to this idea, there could be a possibility that some TLICS 5 or more fracture patients get better by surgery, but could have also been treated successfully even without it. Therefore, when we apply this system in the clinical practice, we should inscribe in memory that this system is a useful one, but not a perfect one that could be applied to every single cases. Individual approach to each single case by case, considering not only the patients spinal injury but also the patients underlying injury or medical conditions should be accompanied. Further prospective studies would be needed to gain further evidence for non-surgical treatment in these certain patients. And furthermore, more well designed large cohort studies on the reliability, validity and effectiveness of TLICS system should be done. The TLICS system gives emphasis on the three major components of thoracolumbar burst fractures, and may therefore be helpful when deciding whether to or not to do surgery. However, there have been some criticisms on the perfection of this system has been presented by several previous studies. Our study revealed a successful non-surgical treatment of TLICS 5 fracture suggesting that the treatment guideline for a high TLICS score, still has limitations. Especially those whom may have a chance to heal without invasive interventions, even more when the patient is at great risk for general anesthesia. The present study advocates that the individual situations of the patient case by case should be considered before making surgical decisions for thoracolumbar burst fractures according to the TLICS system. Fig. 1. Abdominal and thoracic CT scan of the patient on primary work up after motor vehicle injury. (A) Contrast enhanced abmoinopelvic CT scan revealed multifocal lacerations at the right liver with active bleeding at S6 and 8, accompanied with some hemoperitoneum. (B) Multifocal patchy consolidations and ground glass opacities were found in both lung fields suggesting lung contusion and atelectasis with bilateral hemopneumothoraces. Multiple rib fractures were seen as well on both sides. CT: computed tomography. Fig. 2. Thoracolumbar spinal CT scan of the patient on primary work up after motor vehicle injury. Sagittal (A) and axial (B) images of the thoracolumbar spine revealed acute burst fracture with retropulsion & central canal encroachment of the L1 body, with mild anterior subluxation of T12/L1. CT: computed tomography. Fig. 3. Thoracolumbar spinal magnetic resonance image of the same patient 2 weeks after injury. Sagittal (A) and axial (B) T2 weighted images of the thoracolumbar spine MRI presented unstable bursted fracture at the L1 level with prominent retropulsion of the fragment. (C) Multilevel interspinous ligament partial injury with adjacent deep muscle strain was also seen, on fat suppression T2 images suggesting significant PLC injury. MRI: magnetic resonance imaging, PLC: posterior ligamentous complex. Fig. 4. Follow up CT scan 2 months after trauma. Sagittal (A) and axial (B) scans revealed a slight progression of vertebral height compression, but no further progression of segmental kyphosis. On flexion (C) and extension (D) dynamic radiograph images, no segmental motion was seen, suggesting no evidence of instability at the fractured level. CT: computed tomography. Non-surgical management for total score ≤3, surgeons decision for total score =4, and surgical intervention for total score ≥5. Bensch, FV, Koivikko, MP, Kiuru, MJ, and Koskinen, SK (2006). The incidence and distribution of burst fractures. Emerg Radiol. 12, 124-9. Vaccaro, AR, Lehman, RA, Hurlbert, RJ, Anderson, PA, Harris, M, and Hedlund, R (2005). A new classification of thoracolumbar injuries: the importance of injury morphology, the integrity of the posterior ligamentous complex, and neurologic status. Spine (Phila Pa 1976). 30, 2325-33. Patel, AA, Dailey, A, Brodke, DS, Daubs, M, Harrop, J, and Whang, PG (2009). Thoracolumbar spine trauma classification: the Thoracolumbar Injury Classification and Severity score system and case examples. J Neurosurg Spine. 10, 201-6. Patel, AA, Vaccaro, AR, Albert, TJ, Hilibrand, AS, Harrop, JS, and Anderson, DG (2007). The adoption of a new classification system: time-dependent variation in interobserver reliability of the thoracolumbar injury severity score classification system. Spine (Phila Pa 1976). 32, E105-10. Harrop, JS, Vaccaro, AR, Hurlbert, RJ, Wilsey, JT, Baron, EM, and Shaffrey, CI (2006). Intrarater and interrater reliability and validity in the assessment of the mechanism of injury and integrity of the posterior ligamentous complex: a novel injury severity scoring system for thoracolumbar injuries. Invited submission from the Joint Section Meeting on Disorders of the Spine and Peripheral Nerves, March 2005. J Neurosurg Spine. 4, 118-22. Siebenga, J, Leferink, VJ, Segers, MJ, Elzinga, MJ, Bakker, FC, and Haarman, HJ (2006). Treatment of traumatic thoracolumbar spine fractures: a multicenter prospective randomized study of operative versus nonsurgical treatment. Spine (Phila Pa 1976). 31, 2881-90. Mattei, TA, Hanovnikian, J, and H Dinh, D (2014). Progressive kyphotic deformity in comminuted burst fractures treated non-operatively: the Achilles tendon of the Thoracolumbar Injury Classification and Severity score (TLICS). Eur Spine J. 23, 2255-62. Schnake, KJ (2014). Expert’s comment concerning grand rounds case entitled “progressive kyphotic deformity in comminuted burst fractures treated non-operatively: the Achilles tendon of the Thoracolumbar Injury Classification and Severity score (TLICS)” (T.A. Mattei, J. Hanovnikian, D. Dinh). Eur Spine J. 23, 2263-4. Schnake, KJ, Stavridis, SI, and Kandziora, F (2014). 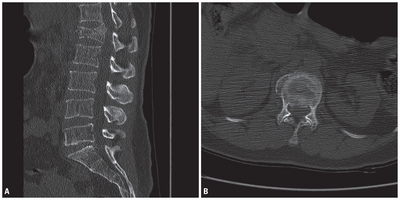 Five-year clinical and radiological results of combined anteroposterior stabilization of thoracolumbar fractures. J Neurosurg Spine. 20, 497-504. Bailey, CS, Urquhart, JC, Dvorak, MF, Nadeau, M, Boyd, MC, and Thomas, KC (2014). Orthosis versus no orthosis for the treatment of thoracolumbar burst fractures without neurologic injury: a multicenter prospective randomized equivalence trial. Spine J. 14, 2557-64. Shen, J, Xu, L, Zhang, B, and Hu, Z (2015). Risk factors for the failure of spinal burst fractures treated conservatively according to the Thoracolumbar Injury Classification and Severity score (TLICS): a retrospective cohort trial. PLoS One. 10, e0135735.